Load ’em up! 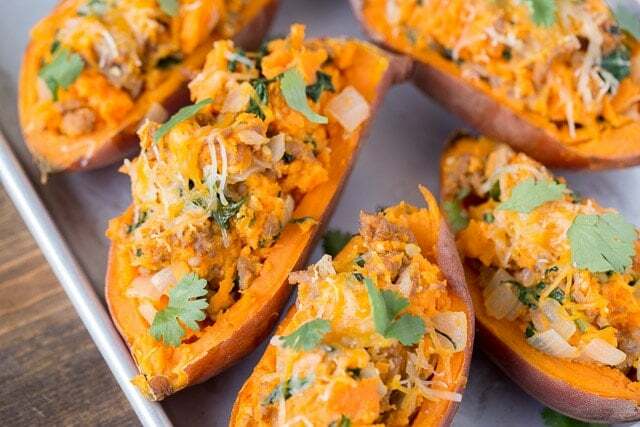 These Twice Baked Sweet Potatoes are packed with spinach, chicken, flavor and a whole lot nutrients! 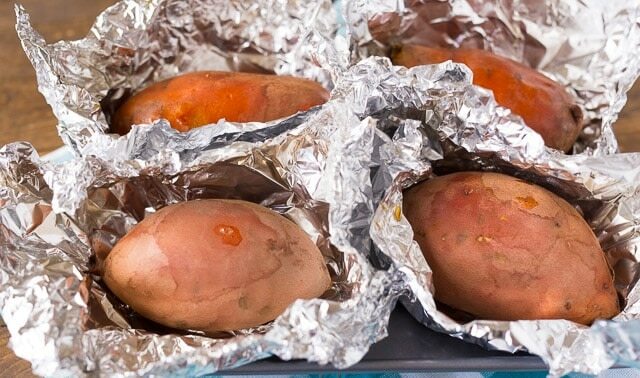 Twice baked potatoes can sometimes be a health disaster. Way too much cheese, sour cream, bacon and the portion is huge! So we took out the sour cream and bacon, made the cheese topping very minimal, and we cut each sweet potato in two. But let’s be honest, the kids probably won’t even finish that! 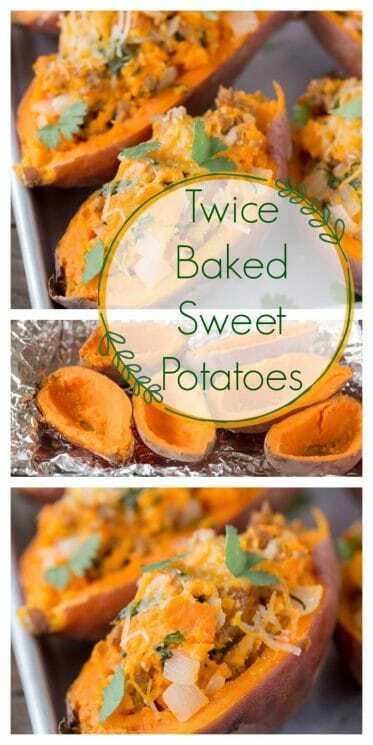 But the biggest change of all is that we made these Twice Baked Sweet Potatoes! 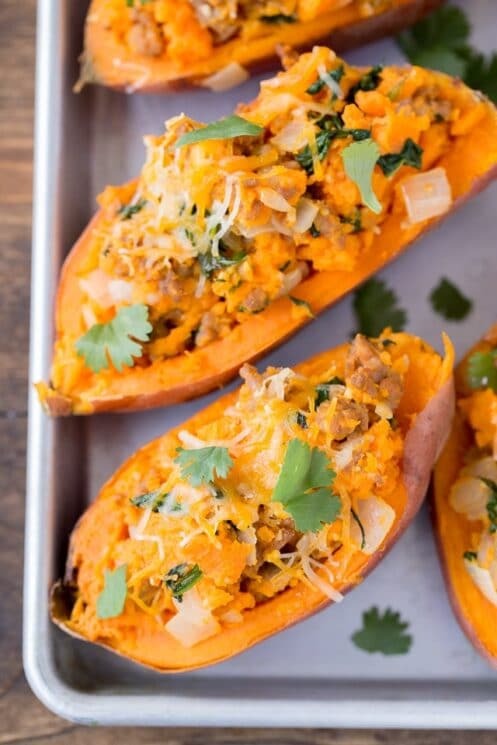 Sweet potatoes are high in vitamin B6, C and have plenty of fiber! 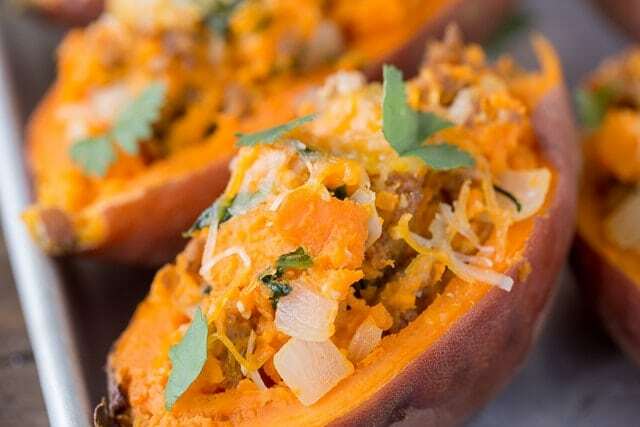 They help keep your immune system strong, provide potassium and keep blood sugar spikes at bay! Let’s go back to the portions… you can serve these any way you like. I split mine length wise but you could also cut them into thirds so you have two “bowls” and one ring. Make the portions appropriate for how old your kids are. If you have teenage boys, they may eat an entire potato! I used spinach in my filling but you can use kale or a mixture of both. I just wanted to add some greens to break up the potato and meat. You’ll notice I didn’t add the spinach until the filling was off the heat, I don’t like overcooking my spinach so I let the heat from the filling cook it down rather than the stovetop. You can also mix in bell peppers, a spicy salsa if you have older kids, or whatever veggies you have on hand! It’s a classic combo! Mix up the meat as you need! I used a chicken sausage that had a bit of a kick to it, but you could use ground turkey, pork, even leftover chicken from the fridge! Just chop it up and stir it in with the veggies! 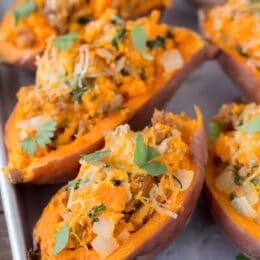 If you’re in the mood for more sweet potatoes these Smashed Sweet Potatoes with Spinach Pesto are incredible! Preheat oven to 350 degrees and bake potatoes until soft enough for a toothpick to stick all the way in. I baked mine for about an hour. Cook until browned and remove from heat. Stir in salsa. Roughly chop spinach and then add to skillet and stir in. The residual heat from the meat and onions will cook it down. When potatoes are cooked, remove and let cook for a few minutes until cook enough to handle. 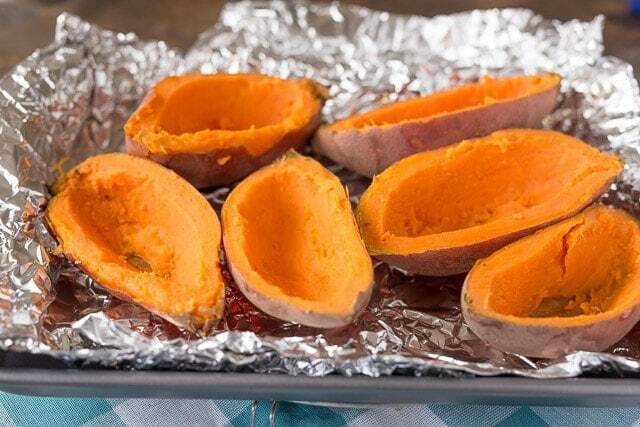 Cut lengthwise and hollow out using a spoon. Add the parts of the potatoes that your remove from the skins to the skillet. Stir into meat mixture and salt and pepper as needed. 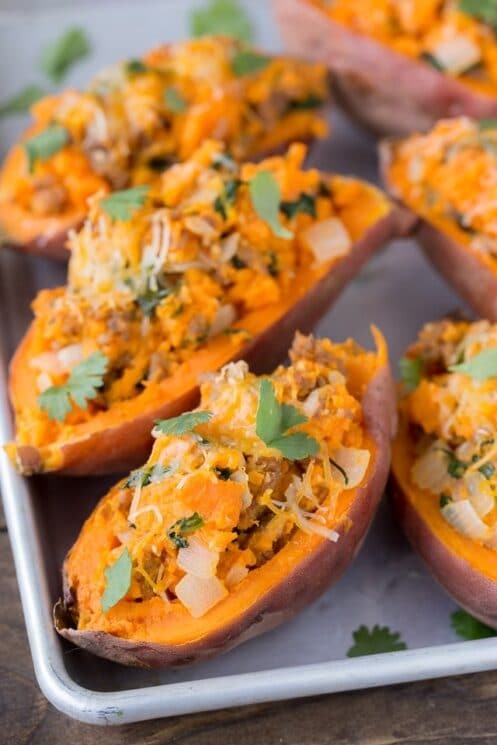 Fill potato skins with meat/potato mixture and top with a little cheese. Return to the oven and bake for 10-15 minutes or until heather through and cheese has melted. Top with cilantro, sour cream, bacon bits or whatever your family likes!